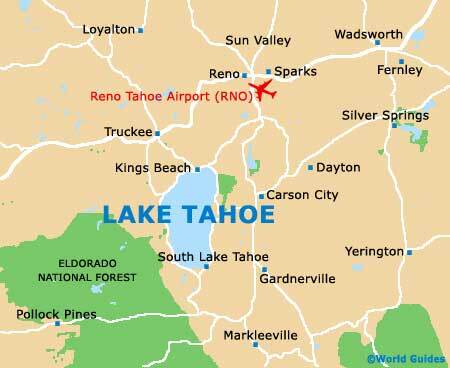 Whilst it would be quite true to say that people certainly never visit Lake Tahoe for its shopping, there are a good selection of stores within the main towns and resorts surrounding the shoreline. On the lake's northwesterly side, Tahoe City is one of the most obvious places for a shopping expedition, particularly at the Boatworks Mall on the North Lake Boulevard, where both mountain outfitters and galleries can be found side by side. 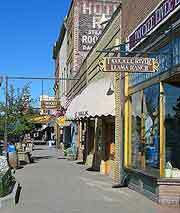 The neighboring town of Truckee is also of interest and lies a little further inland. 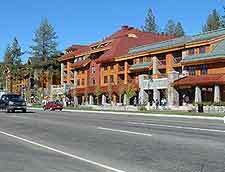 Head south and you will find a host of shops within the bustling city of South Lake Tahoe, which is widely known for its tourism scene and relating shopping opportunities, with large numbers of outlets selling colorful T-shirts and souvenirs, particularly along the Lake Tahoe Boulevard. Here you will find plenty of shops selling a range of outdoor gear, such as camping and mountaineering equipment, and also clothing. In the winter months, shops around South Lake Tahoe cater will for the hoards of arriving winter sports enthusiasts, renting and selling an endless array of ski and snowboarding paraphernalia. 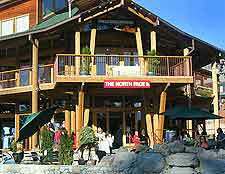 A popular choice is the Needle Peak Ski and Sport Shop on Saddle Road, amongst many others. Alternatively, those headed for the nearby Heavenly Valley Ski Resort may prefer to obtain their necessary equipment at one of the mountain ski / sports shops. Still in South Lake Tahoe, look out for the Heavenly Shopping Center, which resides on Park Avenue, close to the Nevada border, and comprises a small, but interesting collection of stores, well-placed for access to the ski slopes themselves. However, in the peak seasons, everything seems to become just that bit more expensive, particularly within the sports shops. Many locals prefer shopping at the Factory Stores at the 'Y', which can be found where Highway 50 meets Highway 89. this is a good place to come for affordable clothing and women's fashion.